The University of Saskatchewan recently launched a unique and exciting initiative called the “Community-Engaged History Collaboratorium.” This is an extension of Prof. Keith Thor Carlson’s Research Chair in Indigenous and Community-engaged History, and is designed to be on the cutting edge of community-engaged scholarship (CES). In the Collaboratorium, faculty and students work in collaboration with First Nations, non-profit organizations, and community organizations to co-create knowledge that gives agency to historical voices, narratives, and interpretations that would otherwise remain submerged and eclipsed. Building relationships with the community strengthens the position of the University in the broader communities in which they exist. But working collaboratively does much more – it helps give people whose history is contested by the interpretations emerging from powerful corporate and government institutions a voice to challenge these narratives. Collaboration helps reinforce for communities that Universities are important institutions that need to be protected and valued, for the simple reason that they can help serve community interests and provide meaningful scholarly services. It teaches students to think beyond the classroom, and of the real world implications of their work. It reminds universities that they are not institutions of their own and that they are part of the communities in which they exist. 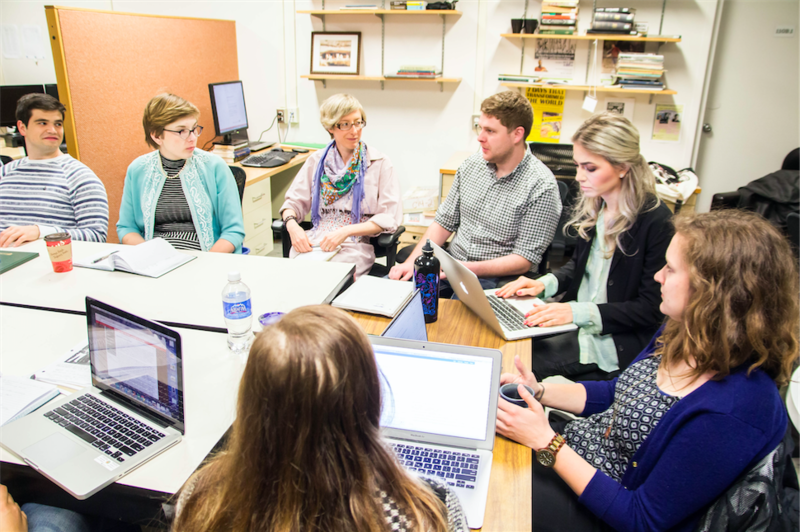 Working Collaboratively: From L to R: Zachary Carreiro, Katelyn Finlay, Kristin Enns-Kavanagh, Anthony Meyer, Courtney Bowman, Hannah Cooley, Jenna Casey. The Collaboratorium consists of a physical space, administrative support, a small amount of seed funding to help launch partnerships, and a whole lot of energetic communication with potential partners to develop relationships and trust. Once these relationships are formed, the Collaboratorium pairs outstanding undergraduate students with community partners to create paid summer research internships. After undertaking methodology training workshops and seminars with a variety of experts, students work directly with their respective communities to develop research plans for the summer semester. At the end of the summer term, students present their findings at a colloquium hosted by the Collaboratorium, prepare final reports, and give all of the compiled research and primary documentation back to their community partners to build capacity for future research. This summer, we have eighteen students working with eleven different community partners. Eleven students are working on topics related to Indigenous history. Five are working directly with three regional First Nations communities, covering topics such as pre-contact migrations and movements, traditional ceremonies, land use patterns, perceptions of Indigenous peoples in early settler correspondence and print media, and the legacy of treaty-making in Indigenous space. 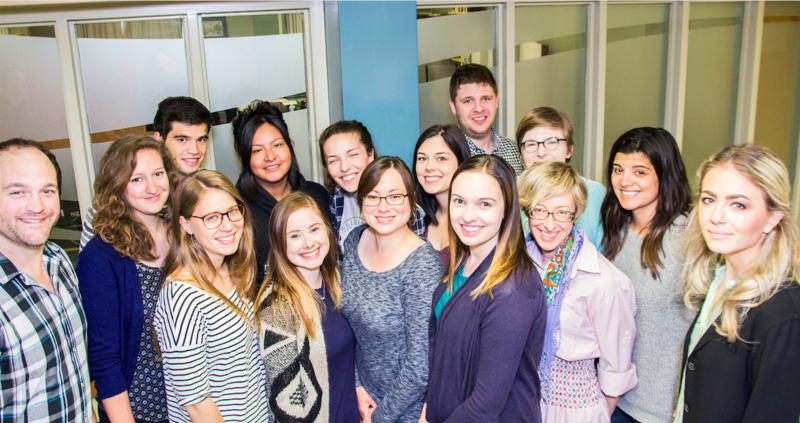 Our largest group (four students) is a multiyear project to build a comprehensive database for Legal Aid Saskatchewan. This database will be a central resource for lawyers and Indigenous community members constructing Gladue Reports for Indigenous peoples who have been convicted of a crime. Two students are involved in researching Indigenous history for different professors at the University of Saskatchewan, whose work focuses on Indigenous communities. The other seven are working on a variety of local history topics to engage the community to become more involved in local history. These students provide an essential service that is largely unavailable for many community organizations. Few communities have the human resource capacity to design and supervise such projects on their own, let alone the physical space to house student interns. Undergraduate students, on the other hand, are eager to put the research and analytical skills they have been developing to practical use for communities. Moreover, the Collaboratorium provides students with the opportunity to gain additional research experience that will help bulk up their CV, and provide them with a solid footing for future careers or graduate studies. Students become ambassadors for the university, a role that instils the importance of experiential community-engaged learning in a way that simply cannot be taught within the confines of a classroom. Undergraduate students truly appreciate the opportunity to demonstrate the skills they have been learning throughout their undergraduate careers. It also gives them a real-world application for understanding the ways in which historical research can shape modern political and social spheres. For Steven Langlois, an intern researching the intangible history of Saskatoon, working collaboratively with the community provides a means for him to “become acutely aware that historical trends and past injustices don’t simply vanish because it’s 2016.” Similarly, Courtney Bowman, a member of a team compiling a database for Legal Aid lawyers writing Gladue Reports, is drawn to the opportunity to work “on a project that has a significant amount of impact in terms of social justice.” Bowman feels that it is an “honour to be able to serve Indigenous people in this way, and to participate in creating such an important research tool.” The Collaboratorium facilitates these interactions. In doing so, we aim to place eager undergrads in positions that will help them expand their educational and academic visions, while at the same time benefitting the community. Institutions like the Collaboratorium are at the forefront of the larger movement to design academic pursuits in ways that are meaningful to the larger non-academic community. But the Collaboratorium takes this one step further. It is not solely about making what we are doing interesting and useful to the community; it is about asking the community what questions they have, what problems they see that are linked to historical interpretation, and how we can collaborate with them to co-create knowledge to help solve their issues. Such an approach ensures that marginalized voices are not only heard, but that communities become active knowledge holders of their own histories. It also ensures that universities are seen less as isolated ‘ivory towers,’ and more as valuable partners in creating better and more inclusive relationships between communities and academic institutions. The Supreme Court of Canada has ruled that judges must take into account the tragic impact of colonial forces and processes on Indigenous peoples when sentencing those who have been convicted of a crime. Interview with author, June 7 2016. Interview with author, June 6 2016.